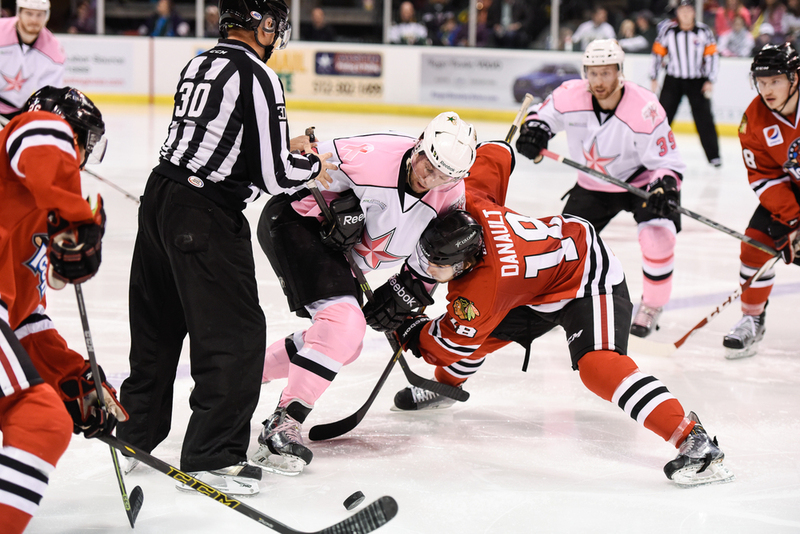 The Texas Stars wrapped up Pink in the Rink weekend against the Rockford Ice Hogs last night. The Stars failed to get a win in the pair of games against the Ice Hogs, falling 6-3. After looking strong in the first and second periods, things fell apart for the Stars in the third as the Ice Hogs got a couple of goals that the Stars were not able to answer. An empty netter made for number 6. The first shot is a face off scrum, won by Rockford. The second shot is the victory celebration following a goal in the second period by Kevin Henderson. The third shot is representative of rough play that developed late in the game, as Scott Valentine shoves his opponent into the net.